I am happy!!! One of my assignments that had given me sleepless nights from the past two days finally got completed and I am back with one more Faces eyeliner review for you. Eyeliners can be the easiest way to accentuate your eyes and draw attention towards them. Isn’t it?? Faces longwear eyeliners are really popular for their smudge proof formula and the price they come at. 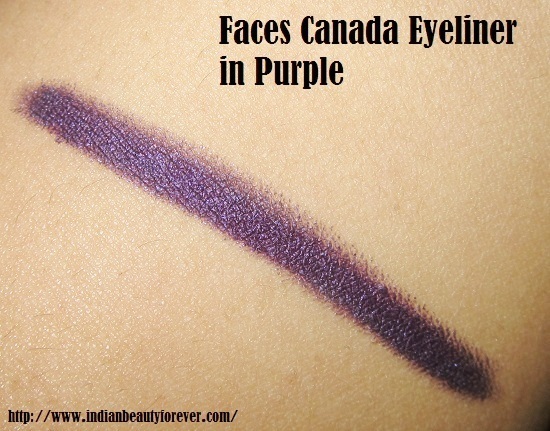 I got this Faces eyeliner long ago and loved it a lot and Today, I will review Faces Canada Eyeliner in Purple. Price: It comes at 249 INR. Product Details: Soft, creamy eye liner pencil glides on easily over the eye lid to define and highlight your eyes. The long staying formula lasts all day, yet is gentle and safe for people with sensitive eyes. My Experience: It is my fourth Faces Eyeliner pencil after Turquoise Blue, Dark Green and Metal Brown. 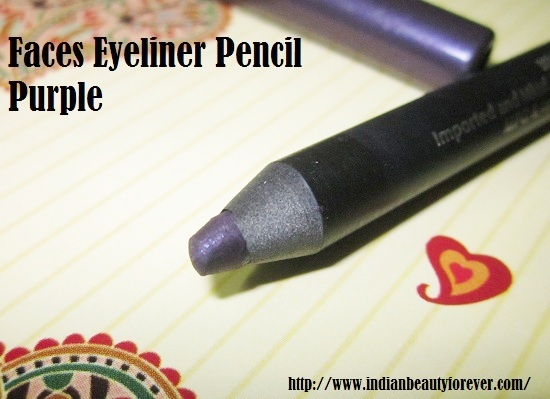 It is just like a regular sharpenable eyeliner pencil. A beautiful Metallic purple shade that will look great on most of the skin tones and can be used day and night without making your look over the top! Colored eyeliner lovers will love this one too. When I used it the first time, It smudged above my crease. That means it is not worth the money!! Pigmentation is very good and it is creamy enough not to tug or pull your delicate eyelids while applying, this is one of the factors that all the faces pencils have in common and makes these preferred over others. In fact, this shows their excellent staying power and can survive on your lids the whole day or until you wish to get rid of it!! Again, the same common complaint that we have with pencil eyeliners, that a lot of product is wasted while sharpening. And you have to sharpen it every time you use it to get the precise line. I think at that price, these eye pencils are fabulous. I am so addicted to them that whenever I think of using a colored liner (I don’t own their black yet!) I will reach for them. They are no doubt amongst the products that are good value for money. These pencils are easily available on all the leading online shopping store and Faces counters. Price is okay with the quantity and quality. Beautiful Metallic purple color would look great on all the skin tones. 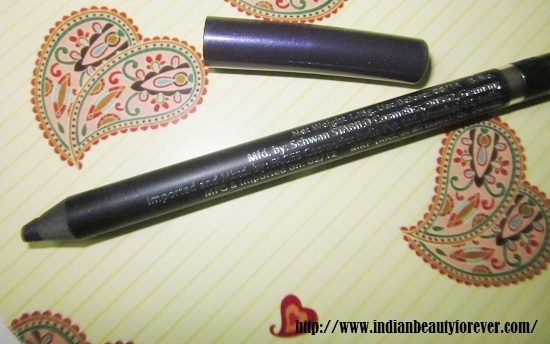 This eyeliner has a creamy formula that glides well and will not tug your eyelids. Smudge proof and lasts whole day or until you wish to remove. It takes a little longer than the other Faces pencil, but once it does, it is smudge proof!! My take: Very pretty color with an excellent staying power. 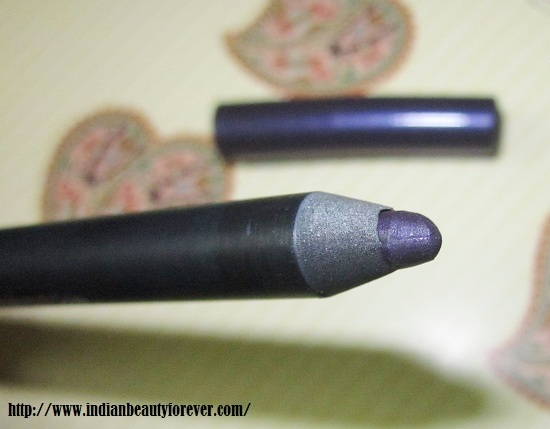 Its price and quality makes it a must try if you like color pencils or won’t mind wearing purple eyeliners. Give it a little time to set and you can expect a smudge free beautiful shade on your eyes!! Thank you Megha. I have yellow undertones in my face as due to which I think green and hazel contacts suits more. Yellow being the primary color in them. He he.. Eyeliners are the only thing I mostly use! I know Shikha. :) saw it in your post too. <3 <3 It is for sure a lovely shade! Thank you Tej. :)Glad you liked the color! your EOTD is simplicity at its best!! I am getting this for myself. Faces are the beast at the price. Isn't it?? It looks very beautiful on you! I'm glad you finished your assignement! the shade really suits to dear!!! Absolutely gorgeous. I just checked out all your faces pencils reviews and this is the prettiest. Also, here you are wearing it on the waterline too. Which means it does not sting, right? By now, I have used all four of them on the waterline and haven't faced any problems apart from stinging too so they are safe there too!